BBS Wheels (front and rear): 13"
The Ferrari F2008 is a Formula One motor racing car, which Scuderia Ferrari used to compete in the 2008 Formula One season. The car was unveiled to the public on January 6, 2008. It features a new standard Electronic Control Unit (ECU), which is the electronic system that controls all the cars, produced by McLaren Electronic Systems. This was included to comply with the new regulations. The ECU also removes most of the driver aids used in previous seasons, including traction control, engine braking and electronically assisted starting system. It also makes the management of the differential, engine and gearchanges easier. The car also weighs more than last season's F2007 chassis due to rule changes which includes the gearbox which has to be used for four consecutive races, higher side protection around the drivers helmet etc. World champion Kimi Räikkönen gave the car its first shakedown at Ferrari's Fiorano test track on January 7, 2008. In the 2008 Australian Grand Prix, Felipe Massa suffered nose cone and front wing damage after an incident with Coulthard. In the 2008 Monaco Grand Prix, Kimi Räikkönen lost his front wing after sliding into the back of Adrian Sutil at the Nouvelle chicane. In the 2008 Canadian Grand Prix, Räikkönen lost his rear wing in the pit lane, after Lewis Hamilton collided with him while the red light still on. In the 2008 Belgian Grand Prix, Räikkönen suffered front wing damage after running wide then spinning before the chicane. In the 2008 Singapore Grand Prix, Massa was unsafely released from his pit box with the fuel hose still attached; Räikkönen suffered a suspension problem then hit the wall in the kerbs. In the 2008 Hungarian Grand Prix, Massa's engine failed without warning, forcing him to retire from the lead with three laps remaining. Kimi Räikkönen driving the F2008 at the 2008 Canadian Grand Prix. Felipe Massa driving for Ferrari at the 2008 Canadian GP. Luca Badoer testing the F2008. The variant front-nosecone has a conduit for air to flow through from bottom to up in the nose. Räikkönen's damaged F2008 is brought back to the pits after the Finn crashed with two laps to go in the 2008 Belgian GP. Räikkönen's fastest lap at the Circuit de Barcelona-Catalunya remained the lap record until it was broken by Lewis Hamilton during the 2018 Spanish Grand Prix. ^ "Ferrari F2008 – vented nosecone assembly". Formula One official website. 2008-04-16. Archived from the original on 2008-12-18. Retrieved 2008-11-25. 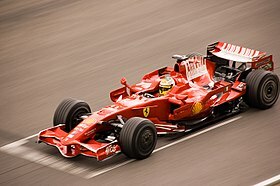 Wikimedia Commons has media related to Ferrari F2008. This page was last edited on 1 August 2018, at 21:18 (UTC).